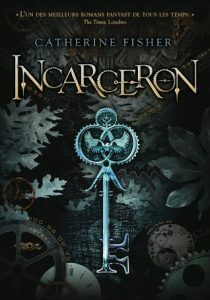 I purchased a copy of Incarceron , by Catherine Fisher. Incarceron is a prison so vast that it contains not only cells and corridors, but metal forests, dilapidated cities, and wilderness. It has been sealed for centuries, and only one man has ever escaped. Finn has always been a prisoner here. Although he has no memory of his childhood, he is sure he came from Outside. His link to the Outside, his chance to break free, is Claudia, the warden’s daughter, herself determined to escape an arranged marriage. They are up against impossible odds, but one thing looms above all: Incarceron itself is alive . . .
Soooo, what to say about Incarceron? It’s good. The writing is stellar. The idea is big and interesting. I appreciate the world-building and the characters. But I felt like I’d been reading this book for 15 years, instead of a week. A lot happens, don’t get me wrong. But it just felt really slow. I’ll read book two at some point. I want to see what happens. But I’m gonna give myself a break from it first. This entry was posted in book review and tagged book review, fantasy, sci-fi on February 28, 2018 by Sadie. 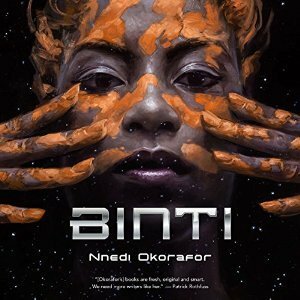 I borrowed an audio copy of Binti , by Nnedi Okorafor, from my local library. Really wonderful. I enjoyed this a lot. I liked the way the author created so much of a world (universe) with so little. I loved Binti and the slow(ish) trust that develops between her and her enemy. But I was a tad bothered that despite her skill as a harmonizer, her success ultimately depended on chance, on something she randomly found years earlier. And I thought the ending came about far too easily. But mostly I adored this. Robin Miles did a wonderful job with the narration too. She had a whistle on her hard S that was painful in headphones, but that was my ONLY complaint. This entry was posted in books/book review and tagged book review, novella, sci-fi on February 23, 2018 by Sadie. 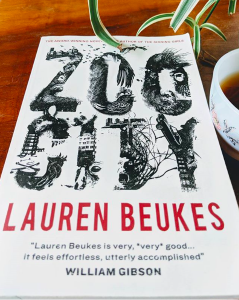 I bought a copy of Lauren Beukes‘ Zoo city . Zinzi has a Sloth on her back, a dirty 419 scam habit, and a talent for finding lost things. But when a little old lady turns up dead and the cops confiscate her last paycheck, she’s forced to take on her least favourite kind of job – missing persons. A friend of mine saw that I was reading this and warned me that it gets quite dark toward the end. She wasn’t kidding. Though I admit I really like the last little tidbit of a chapter, do not go into this expecting a happy ending. I kind of did and had to readjust my thinking. Having said all that, I liked the book. I liked the African setting and characters (They are from several African countries. I don’t mean to reduce a continent of peoples to a single, geographic designator. ), the world and magic system, the plot and the writing. I got a bit thrown by some of the non-English words. I could have done with a glossary, but it was followable. All in all, I liked it. I’m undecided about if I’ll read the next one in the series, but mostly I ended this one happy. This entry was posted in books/book review and tagged book review, fantasy, sci-fi on February 22, 2018 by Sadie.